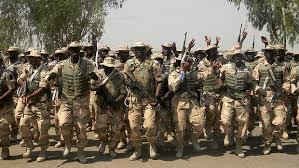 The Nigerian Army has cleared more Boko Haram camps in Borno State, spokesperson, Colonel Sani Usman has said. The camps were located in the Faldan, Kidiziromari, Kuroshini, Kurumari and Ngulda areas of the state. This was contained in a statement released by Usman on Monday, December 14, 2015. President Muhammadu Buhari has given the army till December 2015 to wipe out Boko Haram and end its activities.